update, aug. 26 2007, federal court of appeals in atlanta: august 20th, the five's defense team began presenting various errors of justice in the miami trial of the imprisoned - in september it will be nine years of imprisonment (news source:"five's defense team exposes errors and intimidation of the jury during the miami trial," aug. 21, 2007, digital granma internacional). 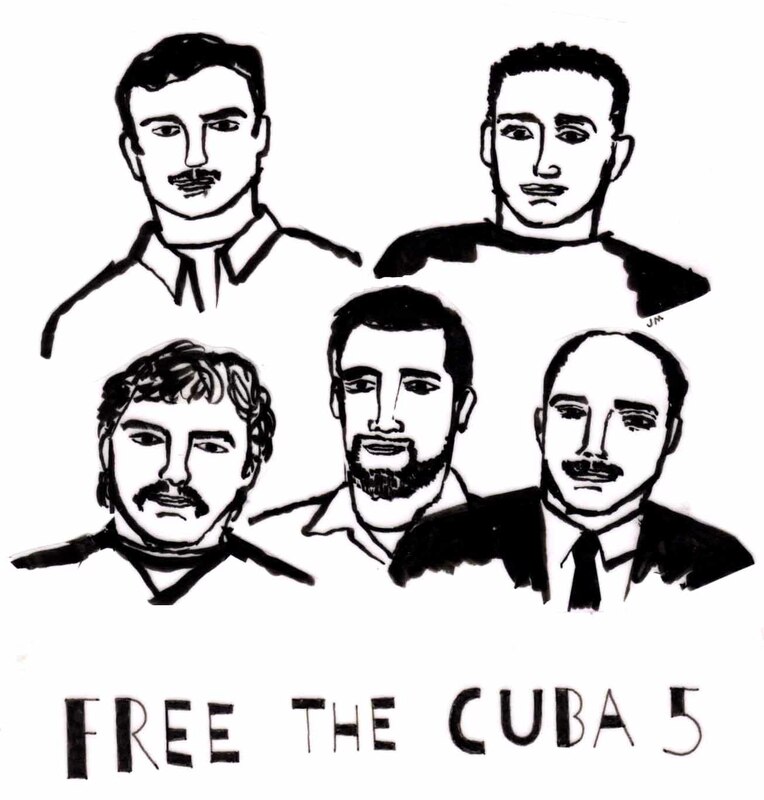 update, aug. 11, 2006: with their convictions overturned by an appeals court panel in atlanta, these five men should have been freed; the u.s. government refused to free them, appealed, and has had their convictions reinstated ("u.s. court upholds cuban spy trial," aug. 10, 2006, <>bbc news). update, dec. 7, 2005: the u.s. government has appealed and the 11th federal circuit court will have to review its decision; the government's political stake is suggested by recent court testimony against one of the arresting fbi officers deeply involved in this case, who is also implicated in the assassination of the venezuelan attorney general ("court of appeals to review ruling on the five," dec. 6, 2005, havana, miami5 website, granma publishing; access: http://www.granma.cu/miami5/ingles/430.html; see also the working group against terrorism www.antiterroristas.cu, and "national committee to free the cuban five," access: http://www.freethefive.org/; "the police who arrested the five participated in the conspiracy to assassinate venezuelan attorney general anderson," allard, nov. 28, 2005, granma international, "national committee to free the cuban five," ibid.). update, august 10, 2005, atlanta georgia: according to the ap, the convictions of the cuban five were thrown out by the 11th circuit court of appeals, in atlanta, august 9, 2005, ruling that the five hadn't received a fair trial due to press and local prejudices in miami ("cuba five win a new trial," august, 9, 2005, digital granma international ). these five cubans infiltrated anti-castro terrorist groups in miami and were arrested by the f.b.i. when cuba disclosed evidence of attacks planned against it; the five were charged essentially with crimes of "conspiracy;" although the u.s. has not been legally at war with cuba, f.b.i. operatives have not provided cuba with protection against attacks from within the united states since cuban independence; failing its mandate the f.b.i. may be operating outside international law, which would explain the intentional injustices of law enforcement and the u.s. judicial system's actions: the extreme sentencing, the choice of a biased venue for trial (change of venue requests were denied five times), the minimal recourse of the accused to their lawyers, the imprisonment in widely differing u.s. locations which make joint defense and visits difficult, the long and arbitrary stretches in solitary confinement and separation from human contact and families, which signal use of psychological warfare against inmates; the cuban five sentences are so severe, for nonviolent crimes, that they have no meaning within a concept of justice other than as a tactic of low intensity warfare; in 2002, u.s. president bush tried to withdraw from the international criminal court, mandated by the international community to deal with the crime of aggression, and which could hold the president responsible for war crimes committed under his authority. arrested in miami, september 12, 1998, the five were placed in solitary confinement for 17 months and not allowed to contact anyone for 17days; when first seen by his lawyer leonard weinglass, gerardo hernández was naked in solitary, and had not been allowed outside human contact; at another instance the prisoner was in chains; denied conjugal visits for more than six years now; reports that he currently lives in "lockdown" at victorville california (ie. without hot meals, phone calls, visits, etc. ); according to "a call by the national union of cuban jurists and the cuban societies of criminal sciences and civil and family law" (havana, june 10, 2003), when the prisoner's wife was given a visa to visit she was detained by the f.b.i. on arrival in texas, fingerprinted, photographed, interrogated and sent out of the country; rené gonzález as well has been denied conjugal visits for more than four years now; according to "a call by the national union of cuban jurists and the cuban societies of criminal sciences and civil and family law" (havana, june 10, 2003), both rené gonzález and his daughter are american citizens; his wife and daughter were arrested and deported when he refused to make a pre-trial plea-bargain to plead guilty to all charges against him. * antonio guerrero rodriguez - charge: general conspiracy and conspiracy to commit espionage; sentence: life plus ten years. * fernando gonzalez llort (ruben campa) - charge: general conspiracy, false identity, failure to register as a foreign agent; sentence: 19 years. * gerardo hernandez nordelo (manuel viramontes) - charge: general conspiracy, conspiracy to commit espionage, "conspiracy to commit murder by the alleged unlawful killing of the four brothers-to-the-rescue pilots by the shooting down by cuban air force mig pilots, in a disputed air space, on february 24, 1996..." (according to "5 political prisoners in the usa," may 29, 2003, radio havana cuba); sentence: 2 life sentences and fifteen years. * ramon labañino salazar (luis medina) - charge: general conspiracy, conspiracy to commit espionage, monitoring an afb and intent to enter military installations; sentence: life plus eighteen years. * rené gonzalez sechweret - charge: failure to register as foreign agent, general conspiracy; sentence: 15 years.